Gabe belts out a song on May 29th during FPB's gig in North Syracuse, NY at the North Syracuse Family Festival. Fritz and Tom present a Jagermeister shirt to Farah Jadran-Pike during FPB's gig on May 29, 2010 at the North Syracuse Family Festival. Prior to this event, Farah had done a fabulous story hyping FPB's appearance. Tom and Fritz present a Jagermeister shirt to Erica Sanderson on May 29th during FPB's gig at the North Syracuse Family Festival. Erica did an interview with Fritz prior to the gig. Frank is shown here singing out a tune during FPB's gig at the North Syracuse Family Festival on May 29, 2010. (Photo courtesy of Jim Newton - Thanks, Jim!) 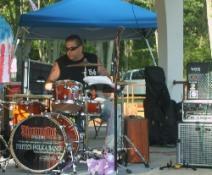 Mike is pictured here during FPB's gig on May 29th in North Syracuse, NY. (Photo courtesy of Jim Newton - Thanks, Jim!) The new bass drumhead artwork, as shown shortly after FPB's gig in Utica, NY on May 22nd at O'Donnell's Pub. Frank and Mike are shown here with Kelly and Donna, after FPB cranked out a rockin' set at O'Donnell's Pub in Utica, NY on May 22, 2010. Fritz's Polka Band rips through a tune during the Benefit at O'Donnell's Pub on May 22nd. FPB cranks out a tune on May 22, 2010 at O'Donnell's in Utica, NY. Gabe tells a story to the audience during FPB's gig in Utica, NY on May 19th at Schuyler Commons at Colonial Square. 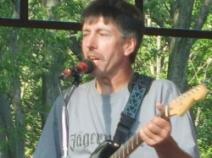 Tom and Frank are shown here during FPB's benefit gig on May 1, 2010 in Verona, NY at The Root Farm. Tom, Frank, and Fritz are joined here during 'Skippy's Polka' by Fritz's great nephew, Tony Cutrie, during FPB's gig on May 1st at The Root Farm. Fritz's Polka Band rips through a tune near the beginning of their benefit gig at The Root Farm in Verona, NY on May 1, 2010. Fritz's Polka Band plays a tune as Paul and Sandra Dendis "cut the rug" at the Finger Lakes Gaming & Racetrack on April 27, 2010. (special thanks to Ken Warner for the pic!). Fritz models his new hat while on break at the Finger Lakes Gaming & Racetrack on April 27th (special thanks to Ken Warner for the pic! ).